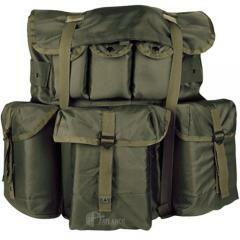 The GI SPEC Large ALICE Pack from Tru-Spec is an exact copy of the U.S. military issue design. It is made from heavyweight ballistic nylon, making it highly resistant to tearing and abrasion and giving it plenty of load-bearing strength, making it capable of holding up to 70 pounds of equipment. It features multiple external pouches for easy organization of your gear, and each pouch comes with an adjustable strap to secure the pocket flap, improving retention. Because the straps adjust, they can be pulled tight to reduce the profile of a partially empty pocket. Please note that the straps and frame are sold separately.